We travel Pan Africa with our February 2019 music schedule Qwela (Uganda), Mandla Mlangeni(South Africa), Sofaz (Reunion Island) and back home to our own Atemi (Kenya). This week we feature our own Diva of song ATEMI. Check out her profile below. Atemi has been described as a love child of Miriam Makeba and Jill Scott- her stage presence during her live shows fills up and brightens up even the darkest and coldest of spaces while her debut album Hatimaye which is Swahili for finally, is powerfully real and emotive. 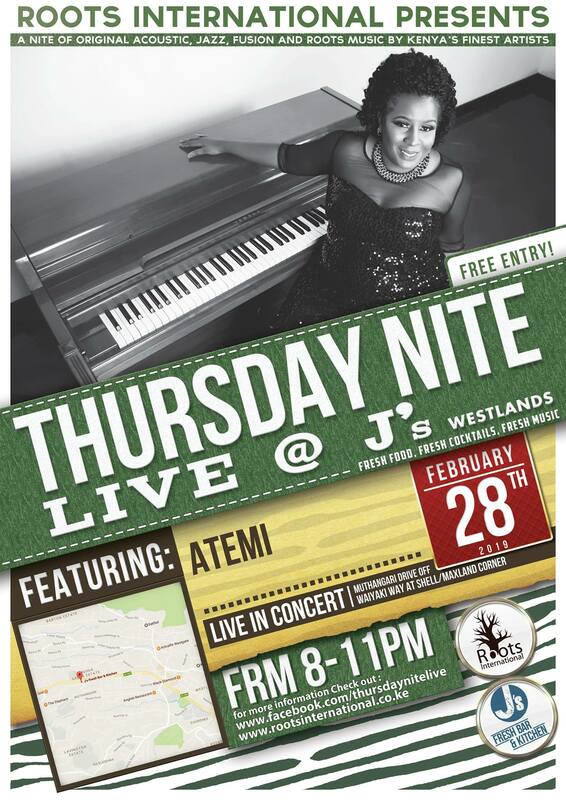 Many have described her music as simply magical, as she is undeniable among Kenyas most talented vocalists. Atemi has headlined at a great number of festivals including the Maputo Flying Carpet Festival in Maputo, Mozambique, Sawa Sawa Festival in Nairobi, the Koroga Festival in Nairobi and Sauti za Busara festival in Zanzibar. She has further established herself as a musical expert on TV shows like Tusker Project Fame and Airtel Trace Music Stars where she has been a judge, coach and Music Director. Her album first Hatimaye, which was launched in May 2008, is a mix of neo soul and afro fusion. Her sophomore album, Manzili State of Life, was launched in March 2013. In 2014, she, amongst other well know musicians, was selected to represent Kenya at the Smithsonian Folklife Festival, that place in June/July 2014 in Washington DC. She has headlined alongside musical greats such as Mbilia Bel, Les Nubians, Anthony Hamilton, Ali Kiba, and Simpiwe Dana to name a few. She has released 4 singles off her up coming and much anticipated 3rd album. These are Moyo featuring Lady Jaydee, Bebi Bebi, Kama We featuring Khaligraph Jones and the smooth neo sounds of You featuring American/Nigerian producer LexiSugar. Passion, hard work, and extraordinary talent only vaguely describe this phenomenal musician. She is defiantly a pioneer for afro soul music in Kenya.